Theresa May thinks Labour voters should instead vote for the Tories. In our time of recurrent political shockers, can you recall a more unexpected revelation? Writing for The Observer, of which more shortly, May channels her maiden speech and riffs off those one nation Tory chords almost as if she hadn't presided over soaring homelessness, food bank use, and the deporting of British people who've lived here for decades. Continuing one of the themes of her conference speech, she wanted to drive a wedge between what she has started dubbing the 'Jeremy Corbyn party' and 'decent' Labour supporters whose politics are firmly aligned with the mainstream. Leaving aside the obvious point that political convergence between the Tories and Labour were key contributors to the rise of UKIP and Corbynism in the first place, May asserts that hers is a patriotic and moderate party that offers proper, reasonable answers to the questions Corbynism raises. And what are these? A good Brexit deal, more NHS cash, driving up school standards and an economy that "works for everyone". May repeats this nonsense with such regularity that she clearly doesn't bother reading her briefing papers properly. But ... there is a but. She recognises that her economy for everyone doesn't, um, work for everyone. To make sure it does we're seeing an energy price cap, a policy the Tories previously attacked as "Marxism" and up there with the storming of the Winter Palace. The Tories are going to build more houses, and allowing councils room to borrow to build council homes too. There are also whispers this morning of introducing a help-to-buy scheme which would incentivise private landlords to sell off houses to their (long-term) tenants. I wonder how many Tory MPs are going to avail themselves of what will be a taxpayer subsidy for flogging off their property portfolio? On the cost of living there's her fuel duty freeze and, um, redubbing the minimum wage the 'national living wage'. She also promises more money for public services after Brexit (news to Hammond). And last of all she has an industrial strategy, it's "stepping up to its proper strategic role in the economy". That's all very well, but what is this plan? Where is it? I don't think May's article is about to win over many Labour voters. Not only that, it's not about winning over Labour voters. The audience for this piece are the people sitting behind Jeremy Corbyn on the opposition benches - the Corbyn-sceptic Labour MPs. As reported in the Graun on Friday, the Tories are on a charm offensive. To get their Brexit deal through the Commons, and it's looking like it will probably be a softer version of May's Chequers compromise, the government needs to win over a clutch of Labour MPs. 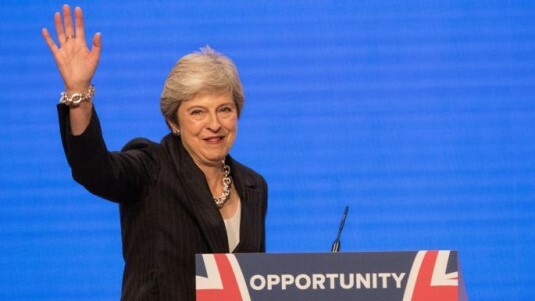 She has clearly realised, at long last, that by annexing some disgruntleds on the benches opposite she can afford to thumb her nose at the hard Brexiteers. Therefore the purpose of embellishing her one nation creds, indeed her whole conference speech was framed with this objective in mind. And lastly, a point on The Observer itself. Some people have expressed surprise that they, effectively the liberal-left paper of record, have afforded the PM space. You wouldn't expect The Mail or The Telegraph to allow a pitch for similar from the Labour leader or John McDonnell. Given the Graun's own survey of its readership, the majority of whom are supporters of Labour under Jeremy, this seems like commercial suicide at a time when hard copy readers are sliding and t'internet page views yield negligible income. The truth of the matter is as the liberal wing of the establishment, its editorial office (and not a few senior journalists) is hostile to Corbynism and, by hook and by crook, what to stay in the EU. For them, securing May's tack to a soft Brexit and the continued decline of the Observer/Graun are the lesser evil to a politics that challenge threatens establishment interests, whether liberal or conservative. Should I continue my subscription to the digital version of the paper? Conflicted Corbyn supporter who enjoys the columnists. That's up to you - if you enjoy it then carry on enjoying it! I'm not part of this boycott Graun thing. 8 years of ideologically driven Tory austerity dogma has led to the slowest post-crisis recovery in a Century, the longest sustained collapse in UK workers' wages on record, failing public services, and the huge wave of public anger that drove the Brexit vote. Boycott the Guardian? Is it worth the cognitive effort? I still read the Graun online but skip over most of their output, which is middle class lifestyle shite. Some of their writers are ok but I was disappointed to read a recent column by Gary Younge, who is usually a very savvy writer, encouraging readers to support 'identity politics'. He article completely missed the point. While the liberal/left marginalise 'class' politics, the alt right will continue to make hay with their notion of 'economic nationalism'. The Graun has never supported the working class; don't expect them to start now! You really need to read Saturday's Graun to get the full sense of the newspaper's sense of middle class entitlement. I particularly enjoyed the column by Tim Dowling, who sharp-elbows his way to the front of a queue at the airport. It says it all! The Guardian AND Observer are Zionist Warmongering Corporatist entities which promote full-on Opinionism and are high on the list of provably "Fake - News" - no wonder it sells so few copies and is not trusted. Class has always been a part of the economic, political and social landscape of England, and I can't see that changing any time soon. The Guardian represents Fabian 'socialism', which is really centre right in an economic sense and culturally left, a left that doesn't threaten the economic advantages and privileges of affluent middle class people. These people love to virtue signal, and love poor people as long as they a) are not white, and b)not within miles of their precious neighbourhoods. They certainly seem to despise white working class people, for all their professed love of diversity and equality and left liberal views. In essence, what working class person in their right mind is going to buy such a newspaper written by self regarding middle class 'intellectuals' (usually ultra self opinionated individuals confined by a very narrowly defined acceptable narrative). The Guardian and the Daily Mail are just two sides of the same coin. More sinisterly, the ugly rise of eugenics again, though nominally seen as right wing, is part and parcel of elite thinking, and I would suggest that racists on the right are more concerned with proving their racist thinking, and some of the 'left liberals', being so hateful of racism, will be far more concerned with proving the white 'lower orders' are inherently dysfunctional. You can see all this on the horizon, and it is purposely to create division between the white working class and other ethnic minorities. Hypocrisy is the order of the day. At least now far more of us are aware of the completely rigged economic and political system we live under.